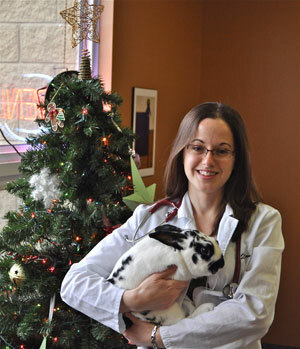 As many of you know, Rabbits come into our clinic (with their owners) every week. We would like to share some information regarding proper care and nutrition of another furry friend. As with any dog, cat, or person, the conditions in which you live and the food you eat has a huge impact on your life. Rabbits are no different, diet especially plays a monumental part in their overall health. The digestive system of the rabbit is somewhat like a small horse, they need a large amount of plant fiber to promote healthy movement of the GI tract. In the wild, rabbits eat grass and can graze for up to 8 hours or more per day. Their teeth are continuously growing throughout life, grasses and hay help to wear down their teeth, helping them to live healthier and longer lives. Most importantly of all, keeping consistency within their diet is key. Because of the fast moving GI tract of a rabbit, they need a large amount of fiber intake. Rabbits should be offered as much good quality grass hay as they can eat each day (Bermuda grass, Timothy grass, oat hay or mixed grass such as marsh or orchard grass). It is best to avoid alfalfa hay, due to the higher proportions of calcium and protein, it is thought that alfalfa hay can contribute to forming urinary tract crystals, which can lead to bladder stones. Most rabbits will eat about their body size in hay daily. We typically recommend wetting down the hay, then shaking out the excess water, to reduce the amount of dust in the hay. There are many rabbits who will react to the dust over time, rinsing the hay can help to minimize this risk. A wide variety of fresh leafy greens and vegetables are the next most important factor in their diet. Dandelions, parsley, herbs such as cilantro, vegetables such as broccoli, cabbage, endives, spinach, bok choy, etc., should also be eaten every day. About 2 packed cups of greens and vegetables per kg of body weight should be fed to each rabbit daily. Rabbit pellets do not meet the full nutritional needs of the rabbit, and thus should be only offered in smaller quantities compared to hay and greens. About the rabbit’s tail size in pellets per day are sufficient. When choosing a pellet type, ensure to choose a high quality product such as ‘Oxbow’ brand. Treats can be offered in very small quantities, please do not exceed 1 tablespoon per rabbit per day. This includes foods such as fruits, root vegetables (carrots, sweet potato), etc. Please do not offer any cereals, grains, nuts, seeds, corn, peas, breads, biscuits, sweets, sugar, chocolate, etc. These foods can cause serious GI issues with rabbits, so they are best avoided. Of course, always provide clean and fresh water, refreshed multiple times per day. Some rabbits prefer sipper bottles, some water bowls and bottles. Food and water bowls should be ceramic or metal, not plastic, to avoid our rabbits from chewing on their bowl. Rabbits are extremely active animals, their ideal housing environment is large pens in open areas. A minimum of 180cm x 60cm x 60cm (6ft x2ft x 2ft) per rabbit is best. They can be housed indoor or outdoors (in hutches), though due to our varied climate, indoor housing is highly preferable. Outdoor hutches should provide shade, protection from the wind, and safety from predators. Rabbits tolerate cold better than heat, with their optimal temperature range between 39-82°F (4-28°C). Any temperature outside of these ranges and rabbits should be brought inside the home. Cages should have a non-slip floor surface, avoiding wire floor cages because of the risk of foot issues and infection. Using towels or newspaper as bedding is best, and change these at least daily. Monitor your rabbit when on towel bedding to ensure they are not eating part of their towels. Rabbits enjoy having a litter tray in their area, which should be changed daily. Also, Rabbits should have at least 30 minutes of exercise daily, with up to 4 hours per day. If they are exercising in the house, keep all cords and edible objects out of reach. Rabbits like to chew and scratch objects around the home. Electrical cords and poisonous plants tend to be the greatest health hazards for Rabbits. Rabbits can be great companions, and they can live from 4 years to over 10 years of age! We highly recommend annual wellness exams with Rabbits, just as with dogs and cats, to help identify illnesses early in your rabbit. If you have any questions about your furry critter, give us a call or book an appointment. Carmel, Brendan. The Healthy Rabbit. AAVAC-UEP 2009. Johnson, Dan. Rabbit Medicine and Surgery. ACVC 2006.